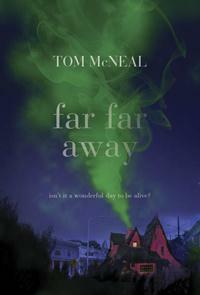 Tom McNeal's Far Far Away, the consensus best book of the year so far here at Little Shop, is here. How good is Far Far Away? Dave guarantees it! Buy it from us. Save the receipt. If you’re not very, very happy, we’ll buy it back. Rarely does Dave fall this hard for a book, but he’s fallen clear off the bus. ... This is perhaps the finest children’s novel since Neil Gaiman’s The Graveyard Book. For ages 11 through adult. Friends, prepare to be ruined by Far Far Away by Tom McNeal, an utterly stunning novel that is destined to become a classic for all ages. As timeless as the fairy tales that inspired it, Far Far Away will worm its way into the hearts of readers young and old. I've already stated that I came to love the characters. Why? They're all uniquely written, as if McNeal knew these people in real life and decided they needed a story of their own. They're likable, kind, care for others, but they're also mischievous and flawed, just like the best of us. Even McNeal's secondary characters are well fleshed out, and many of them get their moment in the spotlight, which I think is generous writing on the part of the author. A very unique read, sort of spooky, definitely creepy as it goes on. With one notable exception, the characters are-not-quite Grimm characters, but nearly. The book is filled with Grimm tropes and you think the author is going to take you in somewhat predictable fairy-tale directions and he doesn’t. McNeal really knows how to make food sound really scrumptious and also various characters twinkly and fun until…they are not. It probably would have given me nightmares as a kid. That is, I was the sort of kid who always freaked out around clowns and there is a character in this book that reinforces just why they freaked me out. Can’t say more without spoilage. Disquieting. STRANGE…but in a good way. It is full of magical realism, dark happenings, references to history and fairy tales, and reflective passages. It doesn’t rush; rather, it ambles along and unfolds its unique story in its own winding way. The style isn’t necessarily for every reader, but I thought it really worked to serve the story and found it quite charming.